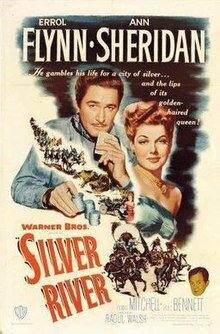 Silver River is a 1948 western film directed by Raoul Walsh and starring Errol Flynn and Ann Sheridan. The film is based on a Stephen Longstreet novel. During the American Civil War, soldier Mike McComb is cashiered from the army when he disobeys orders in order to prevent the Confederates from stealing the one million dollars he is guarding by burning the money. After being publicly humiliated by the townspeople, he and his friend 'Pistol' Porter confiscate gambling equipment and set out to Silver City, Nevada to open a saloon and gambling hall. On his way to St. Joseph, Mike meets Georgia Moore, a beautiful but serious woman that runs the Silver River mine with her husband Stanley and is currently hiring all the available wagons. McComb wins ownership of the wagons in a poker game, much to Georgia's anger. Although he allows her to travel with him, she is unamused with McComb's playful behavior and soon abandons him. Once in Silver City, McComb, in a short time, builds the most successful saloon of the area. He hires John Plato Beck as his lawyer, an alcoholic but good-hearted man. Meanwhile, Georgia is worried when she finds out Stanley has bought back his wagons from McComb in exchange for 6,000 shares in the mine. This is only worsened when it turns out that Stanley does not have the money to finish his smelter and has to go to McComb for finances. Mike agrees to finance him, in exchange for a third interest in the mine. Furthermore, McComb announces to open a town bank, in which the townspeople can accept to pay vouchers in lieu of cash. Despite having become one of the most rich and successful men in area, his bank empire even receiving a visit from the President of the United States, Ulysses S. Grant, McComb is unable to charm Georgia. Encouraged by the President, McComb plans on extending his empire up to and including Black Rock Range. Although he is aware of the dangerous Shoshone Indians in that area, he assigns Stanley to realize his plans. When Plato makes him feel guilty, McComb warns Georgia about the danger her husband is in, but it turns out that they are too late: Stanley has been killed by the Indians. After the funeral, Georgia shortly visits San Francisco and is romanced by McComb upon her return. During a formal dinner party, Plato throws a tantrum while drunk and breaks up the party with accusations against McComb. The townspeople start to lose their faith in McComb and withdraw their money from his bank. To worsen matters, the other owners try to corner the silver market. Georgia begs McComb to reopen the mines, and when he refuses, she leaves him. Soon after, McComb is forced to file bankruptcy. Meanwhile, Plato runs for the United States Senate and in front of a crowd is killed by his competition Sweeney. McComb convinces the towsnpeople to avenge Plato's death. However, when Sweeney is about to be killed by the mob, McComb stops them and convinces them to allow Sweeney to stand trial. He promises to make Silver City a better place, and Georgia, impressed with McComb's new attitude, reunites with him. The film began as an original story for the screen by Stephen Longstreet, who had written Stallion Road. Longstreet said he got the historical aspects of the story from his grandfather Stephen Longstreet, a cousin of General James Longstreet. It was bought by Warner Bros announced in late 1946 as a vehicle for Humphrey Bogart with Owen Crump to produce. Warners hired Longstreet to turn his story into a screenplay. Before the film was made, Longstreet received an offer to have his story published as a novel. By April 1947 both Errol Flynn and Ann Sheridan were signed as leads. Ann Sheridan later said the film "was not a good picture" and Jack Warner "was amazed that I accepted it" but that "Errol Flynn was a big box office name and women didn't get to do Westerns very often and I thought it might be a good combination and I thought that it might turn into a good picture. Unfortunately it didn't." If Flynn is late, if liquor is being used so that from the middle of the afternoon on it is impossible for the director to make any more scenes with Flynn, if liquor is brought on the set or into the studio we must hold Flynn legally and financially responsible for any delay in making the picture. We may go so far as to abrogate the entire contract and sue him for damages...We will never again make pictures where Flynn or any other artist becomes incoherent due to liquor or whatever it may be...This has happened repeatedly during the last pictures we have made in which Flynn has appeared and we cannot permit it any longer. Filming started in April 1947. The movie was shot in Warner Bros studio and on location in Bishop City, California. Flynn's on set behaviour was bad and he and Walsh never worked together again. According to Variety the film earned $2.2 million in rentals in the US in 1948. This was an improvement on recent Flynn vehicles. The film recorded admissions of 1,416,488 in France. According to Warner Bros records, the film earned $2,174,000 domestically and $1,310,000 overseas. ^ Info "Screenplay Info for Silver River (1948)" Check |url= value (help). Turner Classic Movies. Retrieved 2010-01-31. ^ a b Hollywood Letter By Frank Daugherty Special to The Christian Science Monitor. The Christian Science Monitor (1908-Current file) [Boston, Mass] 06 June 1947: 5. ^ Looking at Hollywood Hopper, Hedda. Chicago Daily Tribune (1923-1963) [Chicago, Ill] 19 Dec 1946: 43. ^ NEWS OF THE SCREEN: Ann Sothern to Have Lead Opposite Alexander Knox in 'Indian Summer'--2 Openings Today Fontaine Sought for "Snake Pit" Of Local Origin By THOMAS F. BRADY Special to THE NEW YORK TIMES.. New York Times (1923-Current file) [New York, N.Y] 19 Dec 1946: 42. ^ DRAMA AND FILM: WARNERS' 'SILVER RIVER' TO REVIVE RUGGED DAYS Schallert, Edwin. Los Angeles Times (1923-Current File) [Los Angeles, Calif] 18 Feb 1947: A2. ^ DRAMA AND FILM: Wallis Names DeFore Star of 'Paid in Full' Schallert, Edwin. Los Angeles Times (1923-Current File) [Los Angeles, Calif] 26 June 1947: A2. ^ FOX WILL DO FILM ON KLEMPNER BOOK: 8 Stars to Appear in Version of 'A Letter to 5 Wives' -- Warners Enlarging Studio Special to THE NEW YORK TIMES.. New York Times (1923-Current file) [New York, N.Y] 26 June 1947: 20. ^ MITCHUM TO STAR IN STEINBECK FILM: WILL PLAY ROLE OF HIRED MAN IN 'RED PONY' AT REPUBLIC -- PICTURE TO BE IN COLOR By THOMAS F. BRADY Special to THE NEW YORK TIMES.. New York Times (1923-Current file) [New York, N.Y] 01 Apr 1947: 33. ^ a b c "Silver River: Overview Article". Turner Classic Movies. Retrieved 2010-01-31. This page was last edited on 30 November 2018, at 09:04 (UTC).